Discover what type of pharmacy we are and what we are determined to do for our community. 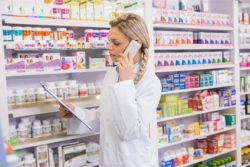 Our pharmacy promises to provide quality service and care to all of our customers. Through the efforts of our staff and our fast and efficient services, we aim to help our clients address their health-related needs. We are a locally owned and independent pharmacy located in Guelph, Ontario, Canada. We give the kind of service that is delightful to discover in today’s day and age, which is why our clients have continued to visit our store throughout the years. Our staff members get to know the individuals and the families we serve in our neighborhood. You can call us for advice you need on anything—from proper dosages and bee stings to flu shots and more. We give you efficient and superb customer service: we fill most prescriptions in ten minutes or less and we accept drug plans. Our pharmacists can answer queries about the medicines you are taking as well as give you more information about any over-the-counter and natural health products. You also can get advice on your health-related concerns without needing to schedule an appointment. And, naturally, we review your prescription medicines to assure they are safe and suitable for you. Our community is composed of people with different personalities, needs, and nationalities. To help those who speak languages other than English, our staff members are fluent in Hindi, Punjabi, and Urdu. Eramosa Pharmacy is grateful to all of our customers for their unfailing support. We thank you for your patronage and we would also like to show our appreciation to our new customers for trusting us to provide you our services. For more information about our pharmacy, do not hesitate to call 519-265-5251 or email eramosapharmacy@gmail.com.